I was really delighted to read Aorewa’s memories of Heather and her poetry. I loved Erena’s letter with its poem inserts. Reading Murray’s editorial on The University of Auckland decisions to shrink The Arts along with sites of book culture and knowledge is essential reading. Heartbreaking to read as a graduate. What can we do? Now back to the rest of the issue! This entry was posted in NZ author, Uncategorized and tagged aorewa mcleod, erena shingade, Heather McPherson, Ka Mate Ka Ora, Murray edmond on September 11, 2018 by Paula Green. Born, Hamilton, 1949. Home: Auckland, Aotearoa New Zealand. Poet (14 books, most recent Shaggy Magpie Songs, 2015); critic (most recent Then It Was Now Again: Selected Critical Writing, 2014) dramatist and fiction writer (most recent, Strait Men and Other Tales, 2015); editor, Ka Mate Ka Ora: A New Zealand Journal of Poetry and Poetics; dramaturge (most recent Jacob Rajan and Justin Lewis’s Welcome to the Murder House, Wellington May-June 2018 and Naomi Bartley’s Te Waka Huia, Basement Matariki season July 2018) and director (Len Lye: the Opera, Auckland, 2012). This entry was posted in NZ author, NZ poems, NZ poetry, Uncategorized and tagged Monday poem, Murray edmond on July 16, 2018 by Paula Green. This is multi-note poetry – each poem a sharp turn to different effect but the poetry co-exists so sweetly. There is not a dud note. Today I am in the mood for surprise. were white with blazing red eyes. I’m translating myself from a time when I was sure. Min-a-ret 8 is a treat to be read on multiple occasions like a good album that needs multiple listenings. Erena Shingade is a poet and arts writer from Auckland, New Zealand. Her work has been published by platforms such as The Spinoff, Landfall, Mimicry, Blackmail Press, Atlanta Review, Ka Mate Ka Ora, & the New Zealand Electronic Poetry Centre. After completing an MA thesis on the Zen Buddhist poetry of Richard von Sturmer in 2017, she continues to research the intersection of the poetic and the religious. During the day she works as a publicist for Allen & Unwin. This entry was posted in NZ author, NZ poems, NZ poetry, NZ poetry journal, nz poetry review, Uncategorized and tagged compound press, Courtney Sina Meredith, erena shingade, Freya Daly Sadgrove, Lee Thomson, Manon Revuelta, min-a-rets, Murray edmond, Naomi Scully, Victor Billot, zack anderson on May 23, 2018 by Paula Green. Join us as we launch A TransPacific Poetics, a new collection of poetry, essays, and poetics committed to transcultural experimental witness in both hemispheres of the Pacific and Oceania. The works in ATPP re-map identity and locale in their modes of argument, resituated genres, and textual innovations. A TransPacific Poetics includes Lisa Samuels, Don Mee Choi, Melanie Rands, Jai Arun Ravine, Ya-Wen Ho, Murray Edmond, Susan M. Schultz, Eileen Tabios, Craig Santos Perez, Corey Wakeling, Lehua Taitano, Stuart Cooke, Sean Labrador y Manzano, Barbara Jane Reyes, Myung Mi Kim, and Sawako Nakayasu, with cover art by Dagmar Vaikalafi Dyck, who will also be present for this launch event. Free & all welcome. Book copies available for a celebratory reduced price of $30 (cash only). This entry was posted in NZ author, Uncategorized and tagged Lisa Samuels, Litmus Press, Melanie Rands, Murray edmond, Sawako Nakayasu, Ya-Wen Ho on July 3, 2017 by Paula Green. A long poem, a magazine, a collected poems and a set of translations. 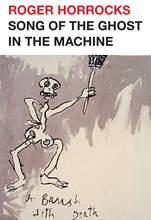 I had the pleasure of giving the champagne-cracking speech to launch Roger Horrocks’ Song of the Ghost in the Machine (Victoria UP, 2015) in the first half of 2015. This is a single poem of nearly 70 pages. Lovely to read a long philosophical, meditative poem, which pays homage to Lucretius’ De Rerum Natura (first century BC). The third issue of Ika from the Manukau Institute of Technology Faculty of Creative Arts is edited by Anne Kennedy. It includes prose and fine arts design and photography, but poetry is the mainstay of the magazine. MIT writing students are featured, but you will also find work by Tusiata Avia, Courtney Sina Meredith, Kiri Piahana-Wong, Chris Tse, Anna Jackson, Emma Neale, Kent McCarter, and Michael Steven among a host of others. Attractive production. Collected poems tend to go on-line these days (eg. 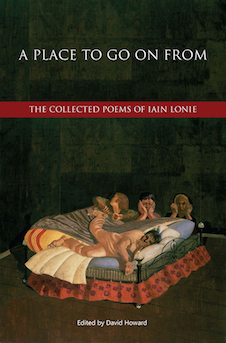 Kendrick Smithyman’s), but David Howard’s editing of the poetry of Iain Lonie (1932-1988) has produced a well-ordered, hard-cover volume from Otago University Press: A Place to Go On From: The Collected Poems of Iain Lonie (2015). There’s a Preface, a Chronology, A Memoir and an Essay to bind the collection together, with Sources and Notes and Indexes of Titles and of First Lines. The layout is generous. Lonie’s output at just under 300 pages was not large and it is here contextualized and clarified by excellent editing. For the poet, the translated poem gives the poet an alibi, ‘slightly displaced,’ having been somewhere else at the time of the translation. This entry was posted in NZ author, NZ poetry, NZ poetry book and tagged Anne Kennedy, David Howard, Iain Lonie, Murray edmond, Pam Brown, Poet's Choice, ROGER HORROCKS on December 9, 2015 by Paula Green.